They wait in the wings before they take their turn in the spotlight, soaking up the light and the warmth they need for optimum growth. Our new greenhouse ... erm ... conservatory is proving to be an absolute blessing for plant rearing. I used to struggle in the old one as it was not as well heated, or lit, and so seedlings sulked and grew leggy. The new one has a glass roof which lets in oodles more light, and has a thermostatically controlled panel heater which keeps the temperature constant. Germination has never been a problem, as a heated propagator will give good results and get the seeds to germinate. 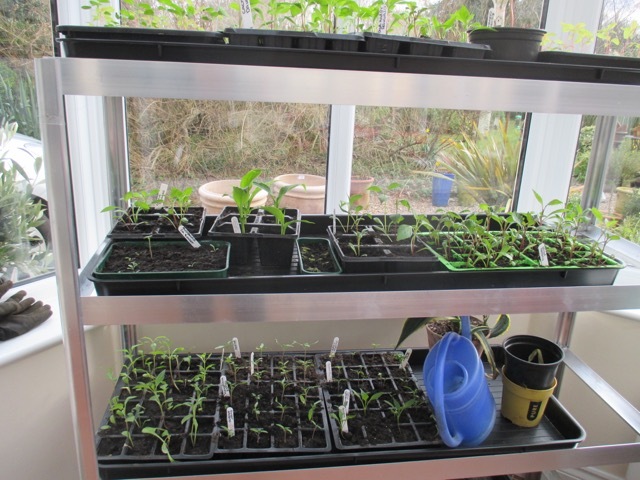 The problem came when the seeds were then moved from the propagator and into the old conservatory which had huge fluctuations in temperature, and got very cold at night. 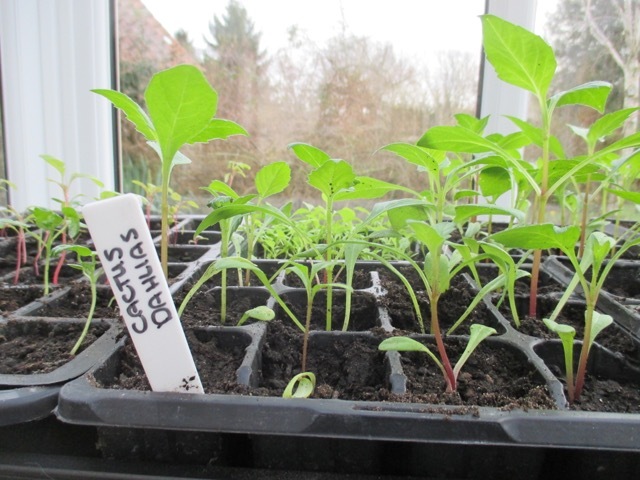 The only way to raise seedlings successfully was to leave sowing as late as possible so that both light levels and the average temperature had both risen considerably. Fine for fast growing annuals like cosmos, and veg like courgettes, but not so good for chilies and peppers, which need a long growing season to be successful. 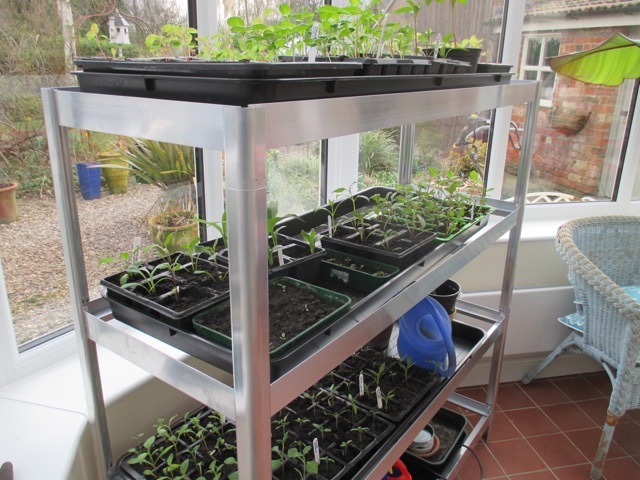 Thank you 'Two Wests and Elliot' for this seed tray shelving unit which we bought a few weeks ago. It is not without fault - it is self assembly but you need the patience of Mother Theresa and the dexterity of Dynamo to be able to put it together. I asked the Exotic Gardener if he had a spare half hour to assemble it, and it turns out he did... three hours later he was still cursing and losing screws and nuts . Very fiddly ... but SO worth it ! 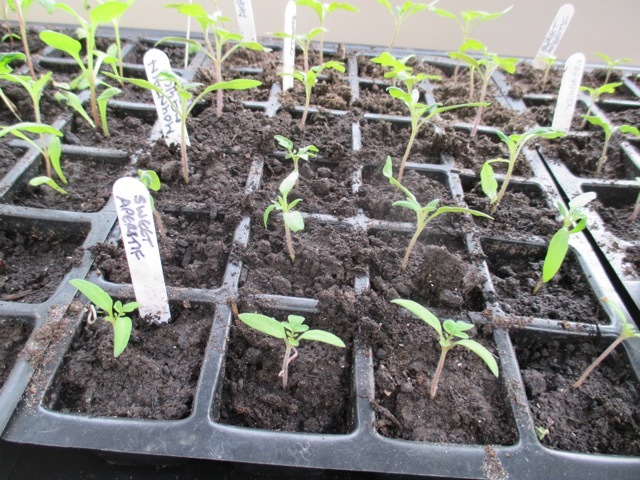 It is exactly the same depth as a regular seed tray, and each shelf has a waterproof plastic tray for seed trays to fit into, so they can be watered without fear of floods! I was concerned that , although the top shelf plants would be fine, that those on lower shelves would have restricted light, and would be leggy and grow towards the light. Not so! All plants are sturdy and straight, although I do turn and move them around anyway. Once the frosts are over the unit can be moved to the greenhouse, where it can continue to do a good job. It has castors on it, and is very light, so it will be easy to move. So, why have I grown 3 different dahlias ? I must have got about 90 babies, and I will not be able to find a home for most of them in the garden! Luckily my friend is running a plant sale for charity, in April, so I will be able to donate the surplus to her stall. I am trying 3 new Dahlia varieties this year - 'Redskin', Cactus Hybrids and 'Victoriana'. All are growing strongly and look very healthy. I sowed them early in February as I want them to flower well this year, so they need an early start to be able to do that. 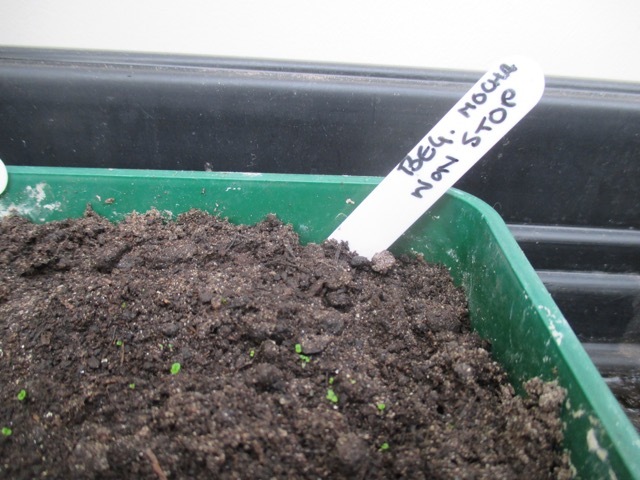 As an experiment, I have some 'Begonia Rex' seeds currently sitting in the propagator, and I have a feeling they may be there some time as they are described as 'slow to germinate' and can be erratic. If they do show their faces, I intend to use them as bedding in the new sub tropical area. However, they are very tender, and usually grown as house/ conservatory plants, so the great outdoors may be just too cold for them, even during an English summer. Thompson & Morgan now sell a Begonia Rex which is borderline frost hardy (well 3 degrees!) called Begonia 'Angels'. They may be more suitable for a summer outside but they are nearly £20 for 4 plug plants ! I will experiment with the Begonia Rex seeds for this season, and see what happens. Other begonias in the propagator are 'Illumination' white and 'Non stop' rose pink. I have never grown these before, or used them as part of a bedding scheme, so , again, an experiment to see how they perform. I am growing five different types of tomatoes, again, planted early to optimise fruiting, and they are all just growing their first set of true leaves. 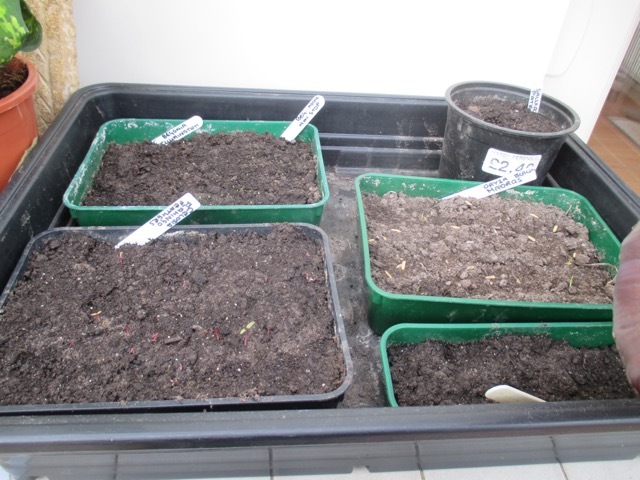 I am growing 'Sweet Aperitif' - small cherry fruits which are the sweetest imaginable; 'Marmande' (beef tomato), 'Romello' ( good outdoor plum, bush tomato), ' Mountain Magic', 'Losetto' , 'Akron' and 'Fandango (jury is out on these four, I was given free seed, so I am giving them all a try!). Other experiments for this season are Amaranthas ( two varieties , 'Caudatus' and 'Velvet Curtains'), and Celocia ('Flamingo Feathers' and 'China Town') which are all being grown as annuals for the new sub tropical area. Also, two varieties of Hibiscus, 'Simply Love' and 'manihot', again, for the new sub trop. 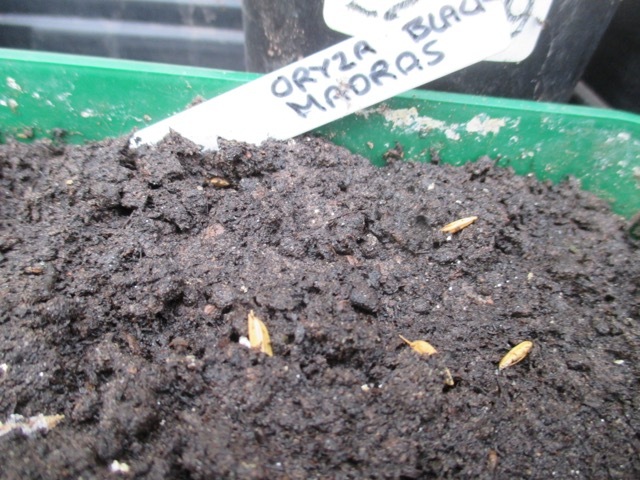 Pictured further up this post are the new shoots of Oryza 'Black Madras' - a dark rice grass, which has just begun to germinate over the last couple of days. 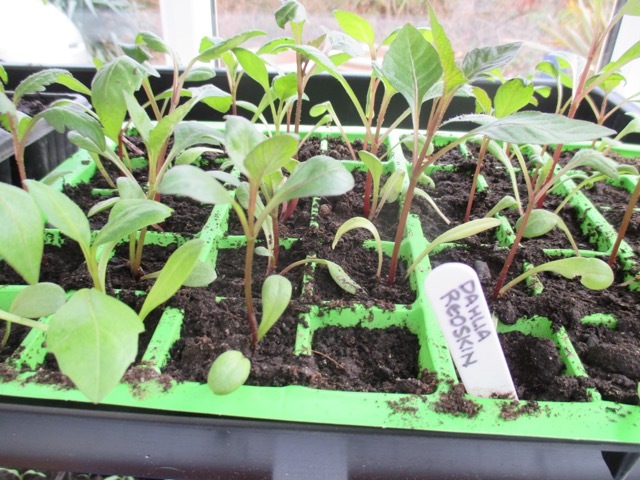 Old faves already cooking in the propagator are Ricinus, although these are proving unusually slow to germinate. 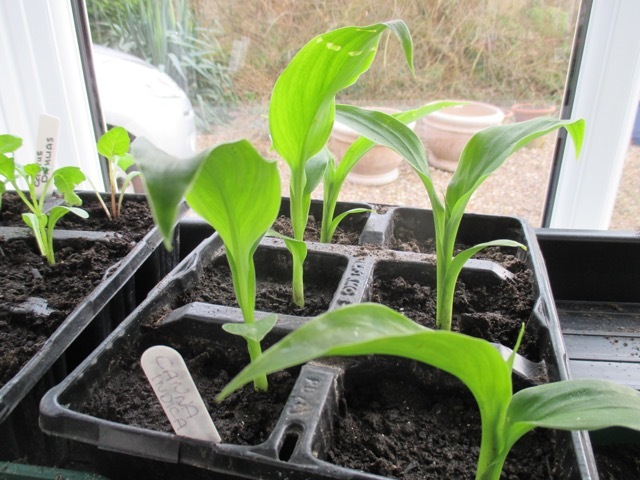 I also have 6 young Canna Indica growing strongly from a January sowing (pictured at the head of this post). Spring has already sprung in your garden :) exciting times! Yes, it is really beginning to feel that Spring has sprung! very uplifting ! Are you out in yours yet? I'm drooling with envy over the shelving unit. In fact I will have to get my low end one set up because as usual I have planted way too much and like you there are trays everywhere. Begonias sound lovely and I can imagine how beautiful they are going to be in your garden. I grew aramanth for the first time last year. It is a very satisfying plant to grow. I am interested to hear that you grew Amaranths last year, Susan. Glad it was a good choice ! It is a completely new plant for me so I am excited to see how it progresses. You've been so busy! It's wonderful to hear about all that you're doing. Hopefully, in a few weeks, I'll be doing outside work, too. I love your growing tray. What a great idea! I was chuckling over the Exotic Gardener putting it together......definitely the way things go around here! The Saver is very good at that kind of thing but, instructions aren't always what they should be! Here's to dry weather for a while longer! Yes, exactly, here's to a dry March so that we can get out there and do what we were made to do! Yesterday was glorious - sunny, still and cold, but today has seen the return of the grey clouds and the rain, worst luck! Being still at the stage of leaving sowing as late as possible so that both light levels and average temperature have both risen, I am envious of your setting. The new growing environment/ conservatory is more of a happy accident than a planned thing, but I am highly delighted ! I am usually really struggling at this time of year - torn between the desire to get sowing and the knowledge that the seedlings will struggle. We are growing Mountain Magic tomatoes this year too?. I'm interested in the Begonia Rex seeds. I may have to try those next year if they work for you. I am interested to see how the Begonia Rex perform - if indeed they even germinate ! Have you grown 'Mountain Magic' before Sue ? If so, how did they do? I grow for flavour above all else! It will be our first time for Mountain Magic. Jane but I read good reviews on one blog. You put me to shame Jane, I have only planted some sweet peas and rudbeckia. The problem I have though is if I start sowing to early I run out of space! I have never had much luck with Rudbeckia, Brian. Is there a secret to germination? I have tried'Cherry Brandy' a couple of times with no results at all. I sowed 'Cherokee Sunset' in February and have had probably about 40% germination. very slow! How fortunate to have a green house...errr conservatory. It looks like lots of fun. It's never too late ! They always seem to catch up ! I know, the sap is definitely rising and all that! Time to cast off my sloth like winter ways and get active again! I can't believe that it's already seed sowing time! I need to hurry up and get the peppers started! I have a greenhouse, but it's hard to heat too, so this year I am starting seeds indoors and then will transfer them out later. I love that seed shelf setup! Nice! It is so much better to start seeds inside where it is easier to keep them nice and warm. Mine will be going out to the greenhouse too, when they are bigger. What a busy bee you've been Jane. You aren't half making the most out of your new multi purpose room. Well done you for being so ahead of the game. I couldn't wait to get started this season, Angie ! Are you growing anything this year ? Wow Jane, your new conservatory is a veritable plant factory! Very exciting. Those seed tray holders look excellent, and others have recommended them too. One for the wish list. Enjoy, hope I get to play outside and get with the ground clearance soon too. Hope you manage to get outside very soon , Janet. We have had some beautiful days this last week. Your seed tray shelving is brilliant. 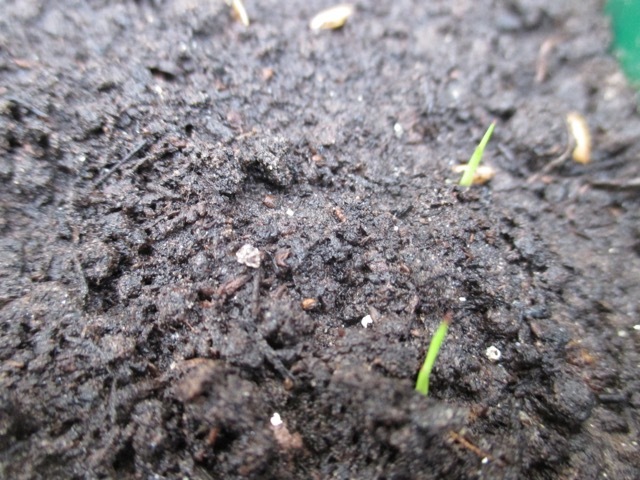 Gosh, you are so well ahead with your seed sowing and everything looks so healthy. You have inspired me to get going. This lovely weather has got me raring to get on. The shelving certainly keeps the place tidier! There used to be seed trays on every available flat surface! I do love your new conservatory! All that light is wonderful. I'm growing little annual dahlias,too, but mine aren't quite as tall as yours since I just sowed them March 1. Which variety are you growing Tammy ? I love that they are so easy to grow ! I am so impressed by your knowledge about seeds and propagation. And the extras are going to a good cause. Enjoy your new conservatory and the seed tray. Thank you Sue! Lots of mistakes have been made along the way! Wow! A lot of work but your efforts will be rewarded. What a fantastic shelving system. I will be interested to see how the begonia rex perform - do keep us updated. First of all, thank you for visiting my blog and leaving your kind comment. I visited your about page and my oh my what a lovely home and gardens you have. Just beautiful! I am impressed with all of your seedlings in this post. Look forward to seeing it all in your gardens. Really nice set up. I think watching seeds sprout and start develop before planting is one of my favorite parts of gardening.